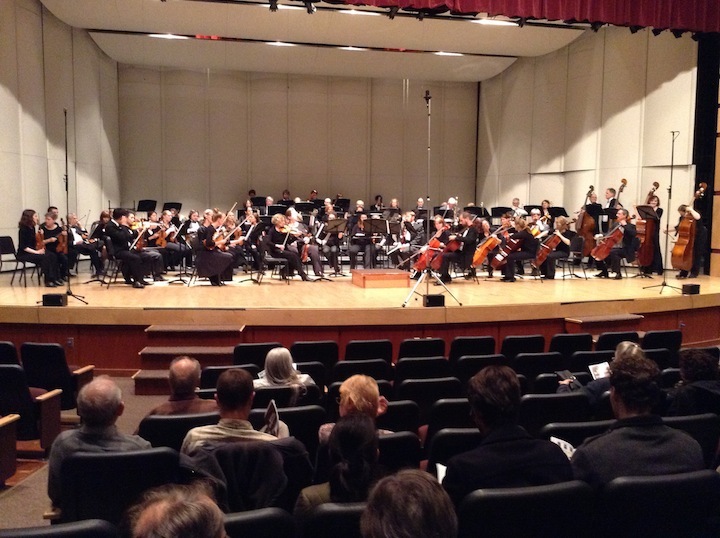 The concert by the largely amateur Middleton Community Orchestra (below, in a photo by Margaret Barker) on Wednesday night presented a novel program at the Middleton Performing Arts Center. In the relatively brief first part, it presented two unusual items. The first was by Nebojsa “Neb” Macura (b. 1982, below right with conductor Steve Kurr), a local musician of Serbian background, who has been particularly identified with Russian folk music and ensembles. 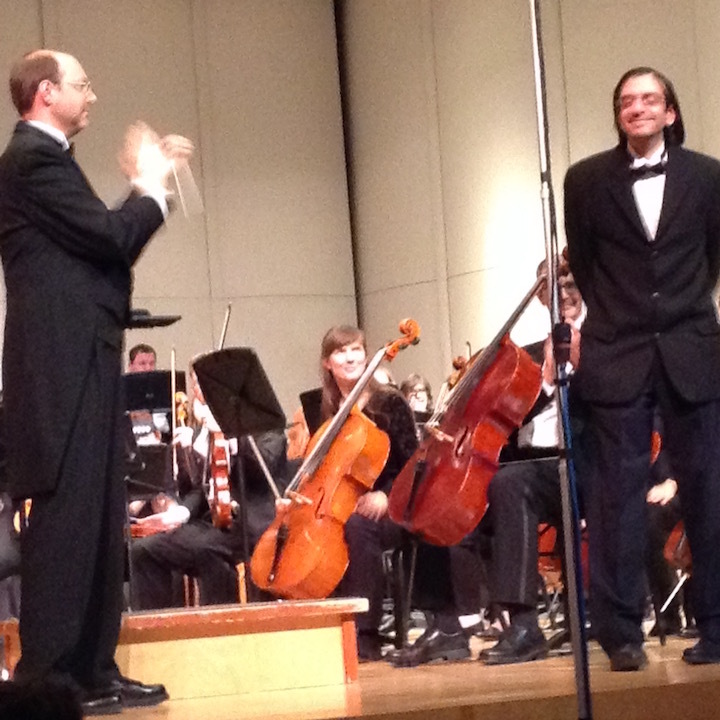 But he also plays viola in the MCO, which gave him this opportunity in the spotlight. His piece, Polar Night, is quite brief, but in this version for full orchestra (with piano), it is grounded with secure melodic flow, and it unfolds into a tonal picture full of beautiful colors. 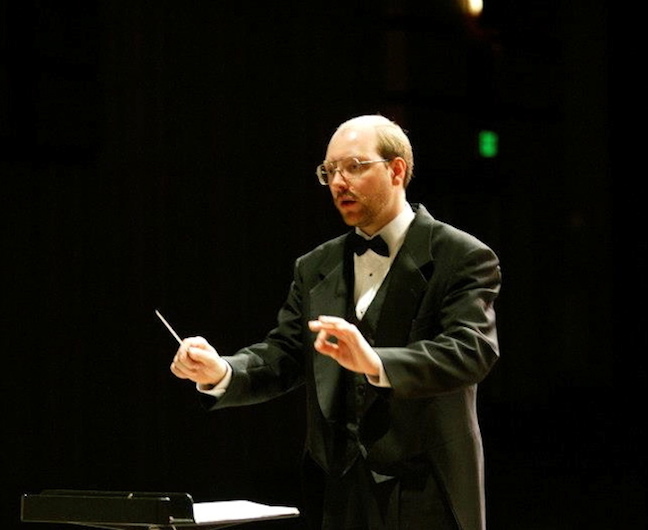 My only reservation was that I wanted more of it — either more music in this piece or other sections around it. Macura is obviously talented, and he has a confident sense of orchestral writing. I really look forward to hearing more of him. Indeed, the MCO might well serve as exactly the laboratory in which he can develop new creations. 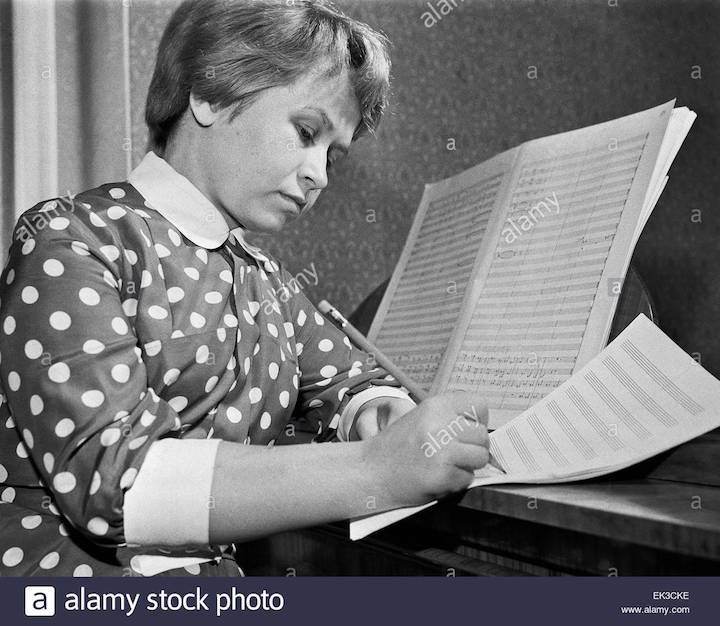 The second item was only a bit longer, a Trumpet Concerto by Russian composer Aleksandra Pakhmutova (b. 1929, below). Her long career has involved her in jazz, and also in extensive scoring for films. But she has a feeling for Russian traditional song, and that could be heard in this concerto. It is cast in only a single movement, but it proceeds episodically. There is certainly much flashy writing for the solo instrument, and local trumpeter Jessica Jensen (below) brought off her role dashingly. The longer second part of the concert was devoted to the Symphony No. 3, the “Rhenish,” by Robert Schumann. This splendid work was inspired by observation of life along the Rhine River. This is a very extroverted work, calling for a lot of orchestral sonority. I suspect that a little more rehearsal time would have helped the avoidance of some blemishes: rapid passages, especially in the first movement, were roughly articulated, and there were some tiny gaffes all along. 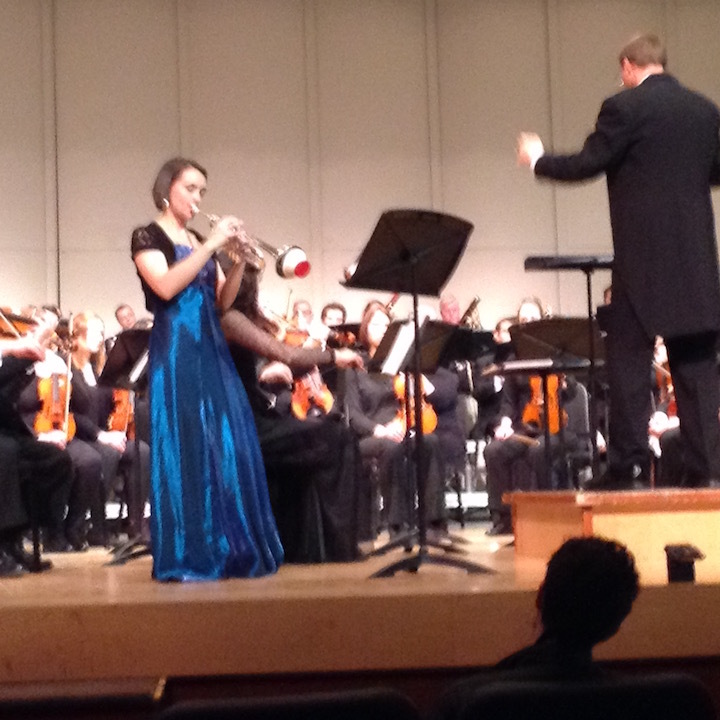 But the players were devoted in responding to maestro Kurr’s rather propulsive tempos. This score gives a lot to do particularly to the horn section, which played with ardent splendor. As always, then, the MCO earned further laurels for presenting this very adventurous program.